It’s not too often that both the men’s and women’s basketball programs are generating a buzz, not only around campus, but nationwide as their seasons get set to kick off. The women, coming off a share of the ACC title last year and a No. 3 seed in the NCAA Tournament, have infinite potential this season as they come barging into the 2011-12 season ranked seventh in both the ESPN/USA Today and the Associated Press preseason polls. 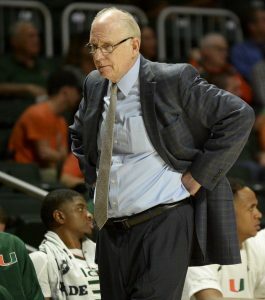 The men, after three underachieving seasons since the team’s last NCAA Tournament appearance, have made a coaching change from Frank Haith to former George Mason Head Coach Jim Larranaga. The Canes are projected to finish fifth in the aptly competitive ACC. When you play basketball at Duke, if nothing else, you will learn how to do one thing: win. 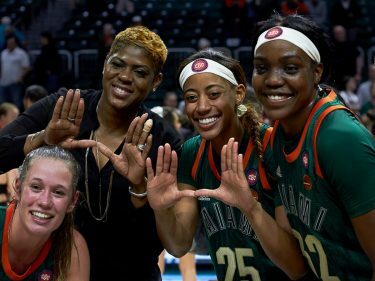 Women’s head coach Katie Meier, now in her seventh season at the helm for the Canes, is bringing that tradition and mentality down south from Durham, N.C. Her experience playing for Duke even helped win her a share of the National Coach of the Year Award last season. The No. 7 ranking for the Canes is their highest since the final poll of the 1992 season and the highest preseason ranking the team has ever earned. The Canes return every one of last year’s players. That team far exceeded all projections and finished 12-2 in ACC play with a perfect 20-0 home record. A year ago, Johnson registered averages of 19.6 points, 8.3 rebounds and 3.8 assists per game. Joining Johnson in the potent backcourt is fellow senior and Wooden Award preseason nominee Riquna Williams. She is looking to expand on a season that saw her lead the ACC in scoring at a pace of 21.7 points per game. The Canes also boast the additions of the 6-foot-6-inch center transfer Shawnice Wilson and freshman guard Suriya McGuire, both complements to the core that has already been established. Fans can look forward to a challenging schedule this year, as the Canes will play nine games against teams ranked in the preseason top 25. There is only one word to describe the men’s basketball team’s last season: frustrating. When the team blew a 19-point lead in the second half against North Carolina in the ACC Tournament, it was hardly a surprise. That served as a microcosm of the whole season – blown leads and poor second half play. Miami has the talent on this roster; now they just need the right coach to turn them around. Who better to take over the reigns than the man who made George Mason University a household basketball name? 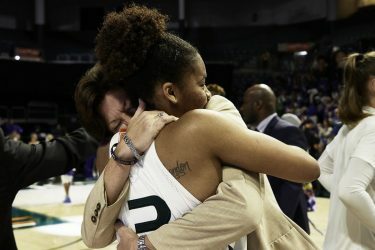 Jim Larranaga took the Patriots to the Final Four as an 11-seed in 2006 in a miraculous run for a mid-major program that will always be recalled when a new Cinderella story develops in college basketball. Larranaga now inherits a team with 11 of 12 players returning. He understands the challenges ahead in getting his team to transition from the style of play they were accustomed to under former head coach Frank Haith. The Canes will be led by the backcourt duo of senior Malcolm Grant and junior Durand Scott. Grant was named to the Preseason All-ACC team after leading the conference in three-point field goals made, three point percentage and free throw percentage a year ago. Scott led the Canes in scoring last season with 19.3 points per game. Miami needs bulk and strength up front to complement the quick backcourt. The team’s premier big man, Reggie Johnson, will be out until January with a knee injury, and senior forward/center Julian Gamble will miss the entire season with an ACL tear. The Canes hope Florida transfer Kenny Kadji can provide the reliability Larranaga needs from his big men until Johnson is back and ready to go. The two teams will keep the BankUnited Center busy on Friday as both are slated to commence their regular seasons: The women kick off the loaded day at 1 p.m. against Texas-Pan American and then make way for the men to take over for the night shift at 7 p.m. against Tennessee Tech.